Elizabeth Ann Galligan, Ph.D, is a poet and retired educator from Eastern New Mexico University who completed her first novel Secrets of the Plumed Saint (ABQ Press, 2012) at the age of 73. She has also co-authored the early childhood book Count on African Animals (2014), a precocious child’s introduction to counting and reading with photographs by Florence H. Kubota. Elizabeth’s poems and essays have appeared in Voices of New Mexico, Too (2013) and More Voices of New Mexico (2015, Rio Grande Books in collaboration with New Mexico Book Co-op), and in the Fixed and Free Poetry Anthology 2015. 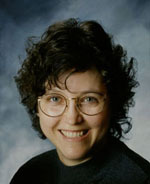 Visit her website at ElizabethAnnGalligan.com. What is your elevator pitch for Secrets of the Plumed Saint? Secrets of the Plumed Saint is a cozy mystery, a tale of intrigue, set in a high mountain valley in a small village in northern New Mexico in the 1970s. When the 100-year-old hand-carved statue of the Santo Niño de Atocha disappears from their chapel, the villagers are so embarrassed they decide to hide the secret from the Church hierarchy and try to find the culprits and discover their motives themselves. I hope readers gain respect for the people of northern New Mexico who honor their traditions and survive in a difficult environment through hard work, mutual support, wits, and religious faith. I wanted to explore the effects of major demographic changes that occurred in the 1970s which brought in outsiders who disturbed the equilibrium of the village. What unique challenges did your first novel pose for you? Never having the notion to write a novel, as well as not having time to devote to writing, I had to wait until I retired in 2007 to pursue various forms. I had always thought I might try to write about a holy man, a hermit, who lived in the area where Secrets of the Plumed Saint is set. I thought I could write a biography, perhaps, but certainly not a mystery. Once I decided to start writing, I found friends, family, and other authors who encouraged me. Incredible serendipitous events started. The right people came along just when I needed their expertise and help. I believe the Santo Niño de Atocha had a hand in it, too. 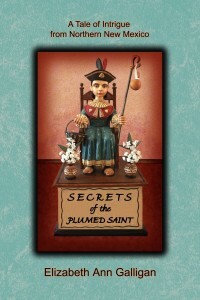 What was the most rewarding aspect of writing Secrets of the Plumed Saint? People often tell me they pass the book along to family and friends. They frequently buy multiple copies. One day a woman of 80 years bought 11 copies and sent them to all her family. She told me, “Your book gave me back my roots.” Her comment made all the effort, confusion, and insecurity about my first novel worthwhile. What do you struggle with most in your writing? What are your strong points? I write a lot of words just to get my ideas down. Some call it wordiness—not a good trait, especially in mysteries. The trick is to go back and force myself to be more concise and make better word choices. I try not to use the first trite phrase that comes easily. We all develop habits in our writing that include certain patterns which we must overcome. Two of my bad habits are using too many adjectives and too many commas. I count finishing the Plumed Saint manuscript at age 73 as one of my best achievements. During the process, I learned I could write dialogue and poetic prose. Since I love New Mexico, I have a strong sense of place which I try to evoke in my writing. Plotting the story and sequence are still challenges. Has writing nonfiction helped you write better fiction? In academic or expository prose accuracy matters, so I learned how to research topics. But academic writing is often dry and of interest to only a few scholars. The pickiness of academic writing now annoys me. Writers of either persuasion have to overcome the ingrained editorial angel (devil?) that sits on their shoulder and says their writing is not good enough. How has your work as a poet influenced your fiction writing? What can other writers learn from poetry? Just because I had written poetry, I did not assume I knew how to write fiction. My own style in the Plumed Saint tends toward the use of metaphors and similes tied to the setting of the story. Fast-moving stories are not for me. I like to meander through the words. Luckily, so do some readers. Most poetry emphasizes concise language forms. In that sense, other writers can learn from poets to make careful word choices. Poetry also invites symbolic language and encompasses suggestions of the mystical and other-worldly realms. In short, any writer can benefit from reading good poetry. A historical novel is in progress, again set in northern New Mexico, a sequel to Secrets of the Plumed Saint. I also intend to write the fictionalized account of a portion of the life of holy man and preacher Giovanni Maria di Agostini, the Hermit of Hermit’s Peak in northern New Mexico. It will be based partially on recent scholarship from the Brazilian scholar Dr. Alexandre Karsburg who made the link between the “holy monk,” as he was known in Brazil, and “our” New Mexican sojourner. Some amazing new research by David G. Thomas adds depth to Dr. Karsburg’s research. My book in progress (working title Holy Enigma) is a novelization of the effects of the Hermit on the people of the time who came in contact with the itinerant Italian preacher. Memories and stories passed on orally (some documented) indicate the holy man’s impact in the northern New Mexico Territory around Las Vegas and in the southern part near Mesilla. The Hermit inhabited a cave near Dripping Springs in the foothills of the Organ Mountains from about 1867 until his murder in 1869. Who killed him and why remains a mystery to this day. Just begin. Trust yourself and your words. Forget many of the things you learned about “rules.” As Mark David Gerson suggests in The Voice of the Muse, there are 13 rules. The first is: There are no rules. The story exists and you are the vehicle which carries it. However, your publisher will have rules you need to follow. Honored to have been quoted! Congratulations on all your achievements, Elizabeth! !